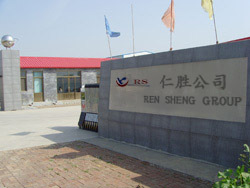 Shijiazhuang Rensheng Pipe Fitting Co.,Ltd.has specialized in all types of industrial pipes and pipe fittings since our beginning in 1998.We have a staff of 298,including 80 professional technicians,and our company covers an area of 160,000 square meters.In order to provide high quality,economically priced industrial tubes,flanges,and industrial pipe fitting,we have purchased testing equipment which is used for chemical analysis,water pressure testing,X-ray inspection,ultrasonic testing,eddy current inspection,tension testing,chemicaltesting,etc.We are also ISO9001:2000 approved. We are located in No.91 Longtan Road,Yanshan Industrial zone, Cangzhou City,Hebei Province,China,near a large sea port and other convenient transportation,Thus,the shipping fees for our customers are reduced. We primarily provide industrial pipe,industrial tube fittings and industrial flange.Our products are strong and sturdy,highly resistant to corrosion,and are SGS and ABS certified.They are used in a wide range of industries and applications,like electric power,petrochemical,chemical,pharmaceutical,boiler,heating,shipbuilding,etc.Due to their high quality and low price,our industrial pipes,flanges,and pipe fittngs,are exported to Poland,Italy,India,Thailand,Korea,Brazil,Spain,Middle East and South America,and so on. Pipe-fitting Standard: ANSI B16.9/16.28,DIN 2605 / 2616,JIS P2311 / 2312. Flange Standard: ANSI B16.5,DIN Series,JIS Series. While providing high quality,low priced industrial pipe and flange,we strive to furnish complete customer service.For example,we offer free samples,a three-year quality warranty,and customized products can be designed by our technicians according to customers'requirements.Also,OEM service is available upon request.We welcome you to visit us and try our products.For inquiries or orders,please feel to contact us .We are certain that you will be satisfied with your purchase,and we look forward to working with you.